New technology, new refrigerants and a whole new convention dedicated to the sector: Mike Owen talks air conditioning and how you can work it. Well, here we are again, past the middle of another year, but perhaps a little lateral thinking could bring some new opportunities for part two of 2014. The Automechanika show looms large on the horizon, September in Frankfurt is where the European Automotive Industry gather to look at the new vehicles, and for us in the aftermarket, the challenges that we will face in time to come. Of course the temptation is to look, often in vain, for the ‘golden opportunity’ that will fill the workshop with work and the till with money. Yet there is one opportunity that already exists and is growing in importance with new technology. It has its own European convention (September 21 and 22) also in Frankfurt following on from Automechanika, and goes almost exclusively unnoticed other than by those who specialise in it. And even then it draws a world-wide audience of hundreds. Air conditioning and the European Automotive Air-conditioning Convention (EAAC) is overlooked by the many and is the staff of life to the specialists. 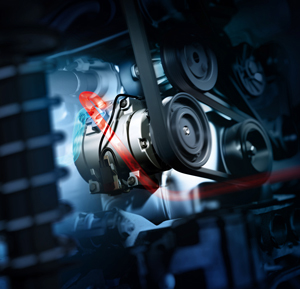 Refrigeration is still a fringe activity for the majority of garages who in general fit into the ‘gas-and-go’ denomination rather than the specialist, yet this subject and its potential is immense. As the prevalence of automotive air conditioning grows, so do the returns on investment for those who choose to grasp the opportunity. As we move towards electric traction, regardless of how the power is generated, transferring it into storage in some form of battery system causes heat – and lots of it. Providing cooling for this function, thereby extending battery life – and we’ve all heard about the costs of those batteries – becomes as important as the comfort of the passengers. Consider, then, the effect of stop-start technology and how the compressor can be kept operating during the ‘engine-off’ periods and you will quickly appreciate that the compressor will be, like the rest of the car, electric driven so that the battery cooling can be maintained during charge periods, such as when the car is connected to a local lamppost. It is commonly known that these electric compressors, to be efficient, will be 48V and there is a move toward the entire vehicle electrics becoming higher voltage to accommodate for this. You will have read through the auspices of this journal the ongoing spat between Mercedes-Benz and the European Union vis-à-vis the new gas R-1234yf and the fear of its combustibility – more likely to be a cost-based argument when the exalted cost of this new gas is considered. The German car manufacturers are known to be working on a high-pressure CO2 system – and that brings us to the subject of investment. Why? Because with the run-out of R-134a, the introduction of R-1234yf and the blitzkrieg from Germany of CO2 that is three types of gas and three types of machine to work on those systems – but beware, there is a fourth gas, R-744 (and system) appearing on the horizon and then possibly R-445a shortly afterwards. “I didn’t know about that,” you say. Join the club, neither do the majority of our industry, but that is where the future is taking us. As the market and the proliferation of systems grow so does the need for expertise to work on them; it is down to each business, or its owner, to be looking at how to reach out for these opportunities, to weigh up the pros and cons and consider the business case for those to bring into the garage and offer to your customers. DO NOT buy the equipment for these new systems outright. I have covered before the need to lease equipment in order to create return on investment and not to destabilise the funding of your business. If you want to join this sector of the aftermarket and grow with it, you must appreciate that utilisation of the equipment and training will be spasmodic to start – all the more reason to be deferring the payment on the investment. Just as there is an opportunity for selling your service there is an equal opportunity with parts – just like all other parts you need to be aware of OE parts through secondary routes to market, and tell apart those what are good and those that you fend off with a barge-pole; this experience can be gained with untold pain or by mixing in a community that know the answers – just as you do at the minute with your other competitive parts. Immersing yourself in this subject brings real knowledge and huge business potential. But all of the information within this article was gleaned from my attendance at the last EAAC in 2012 – that’s right, its old news in the specialist circles. Perhaps if you want to add something new to your business, a new service to offer your customers rather than directing them back towards the franchised dealers it may be time to look deeper into opportunities that already exist, so stay after Automechanika or make a special visit to the EAAC, you may be surprised at what you discover. I’ll look forward to seeing you there. Sorry to dissapoint, but notification was sent out in July by Ron Henselmans explaining this years convention has been cancelled due to personal/family issues.